One of my 2010 goals was achieved last week! 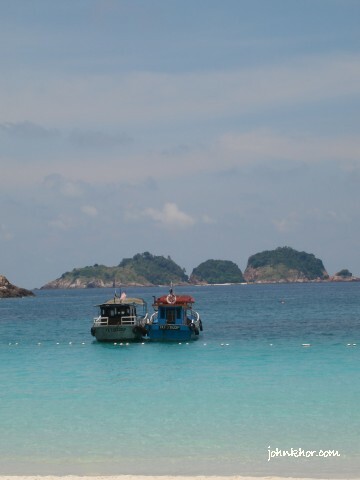 I went to Pulau Redang, Malaysia! Yeah! Made it to Pulau Redang! 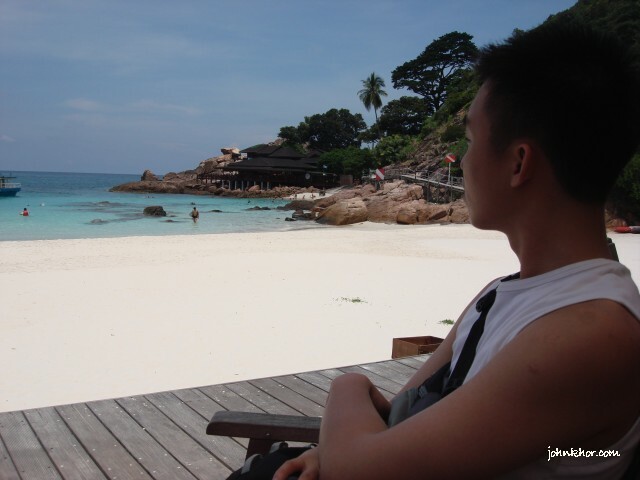 I organized a company trip to Pulau Redang after we managed to hit our sales target. We took the 4 Days 2 Nights package. What is 4 Days 2 Nights? Haha. I was confused at first because I only heard before 4 Days 3 Nights packages but 4D2N? 4 Days 2 Nights means that we spend 1 day traveling to our destination, 2 nights at our destination and 1 day traveling back to our home. My girlfriend researched about all Pulau Redang resorts and hotels and finally we narrrowed down to two, Laguna Redang Island Resort or Berjaya Redang Resort. 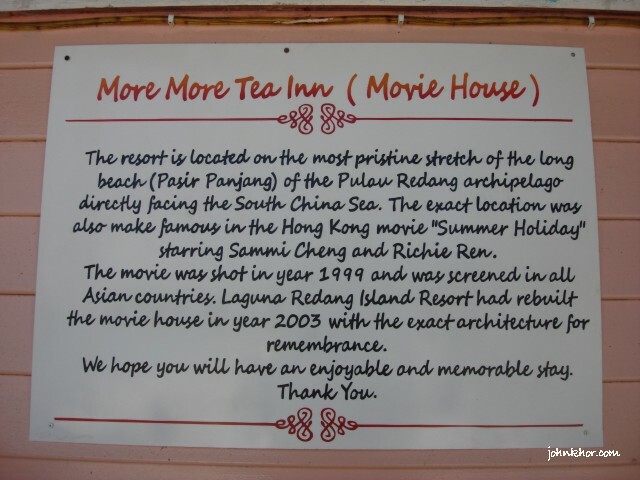 We picked Laguna Redang Resort because it was a 5-stars hotel and we also want to see the More More Tea Inn that was filmed in Summer Holiday, starred Richie Ren and Sammie Cheng. 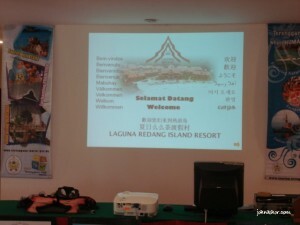 Laguna Redang Island Resort Entrance. 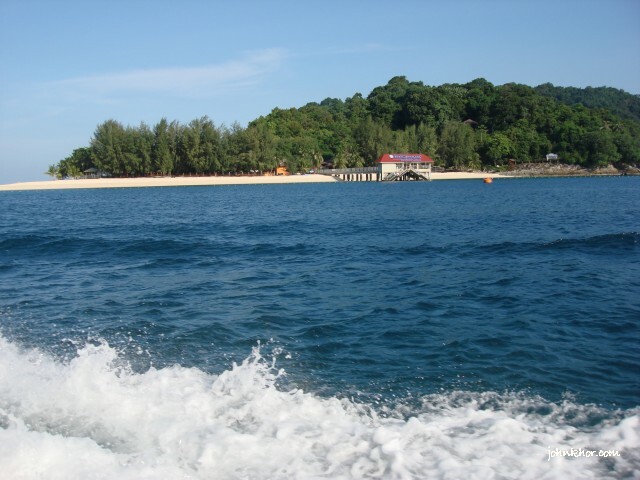 The Redang Island Tour Package costs us RM618/pax. I will blog about the whole trip since I cannot really find any information about the whole trip. It will be long and be prepared! We boarded our bus at 1015pm on the 1st day of our Redang trip. We arrived at Merang Jetty around 645am. Our bus driver was a very quick one. My girlfriend said that he drove ‘fast & furious’ even though when he was doing the turns. 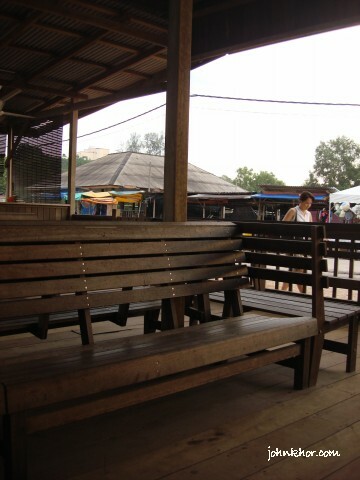 The bus trip from Penang-Merang Jetty, Redang Island-Penang costs Rm120. One thing that you must do before taking up a Pulau Redang package is you must confirm your arrival time at Merang Jetty. Why? Because most boats start at 930am and if you reach there at around 7am, you will be bored to death. There’s nothing to do cos it’s dark and there’s no comfortable chairs for you to sleep. Imagine that. Actually, you can walk to here and have a good sleep here. We waited for our boat. 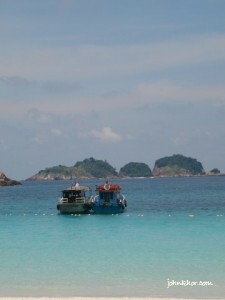 The boat would bring us to Pulau Redang at 930am. Quite comfortable, with a good air-conditioning. Before that, you will have to go over to the counter to collect our boarding pass. Remember to bring your itinerary and show to the person in-charge to claim your boarding pass. 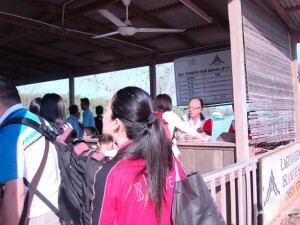 Counter at Laguna Redang Island Resort Waiting Area. Also, before you buy the Redang package, you must confirm whether your package includes the marine park fee (RM5.00 for adults and RM2.00 for children/senior citizens). 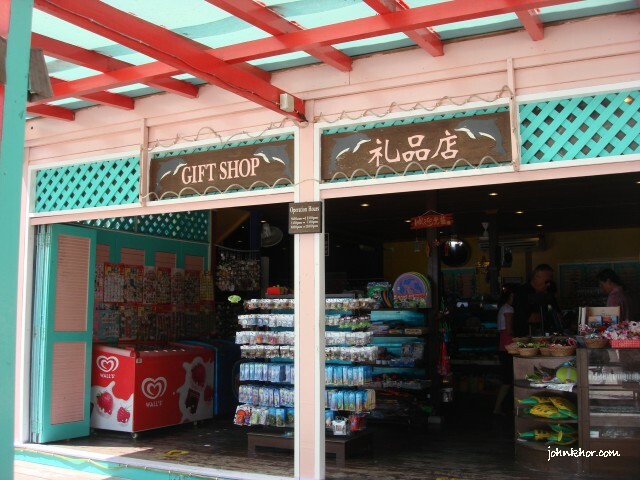 If your package does not, then you will have to buy from the person in-charge and keep it well because you will need the tickets for your entrance to Redang Marine Park. 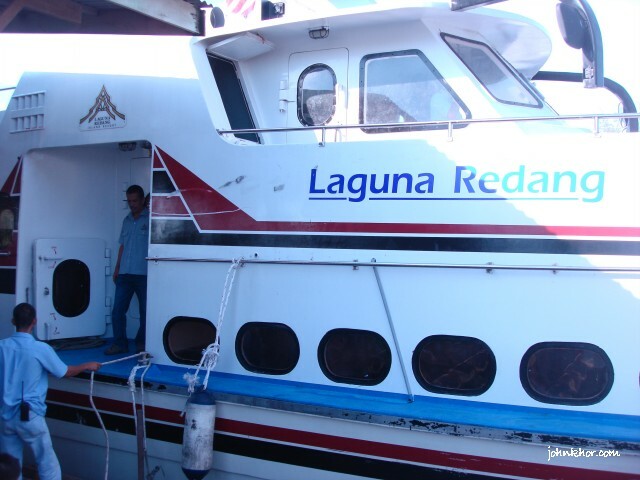 The boat trip from Merang Jetty to Pulau Redang will take around 45 minutes to 1 hour depending on the condition of the sea. We reached Pulau Redang at around 1020am. We went into a hall and the Laguna Redang staff took the stage and briefed us about the itinerary and dos & donts in Pulau Redang. Laguna Redang Island Resort Waiting Hall. There’s a tram to bring us from Laguna Redang Resort’s jetty to the hotel lobby. A walk from Laguna Redang Resort jetty to Laguna Redang Island Resort lobby was about 7-12 minutes. 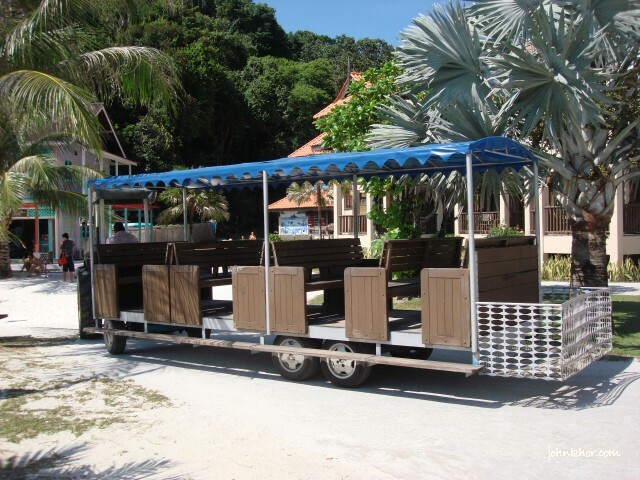 Laguna Redang Island Resort’s Tram. 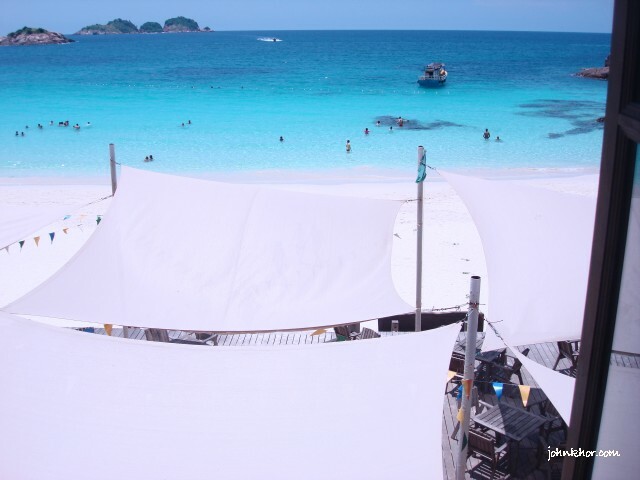 At first, when we saw the beach and the sea at Laguna Redang Island Resort jetty, we were like, ‘Huh? Is this what I heard about Pulau Redang? 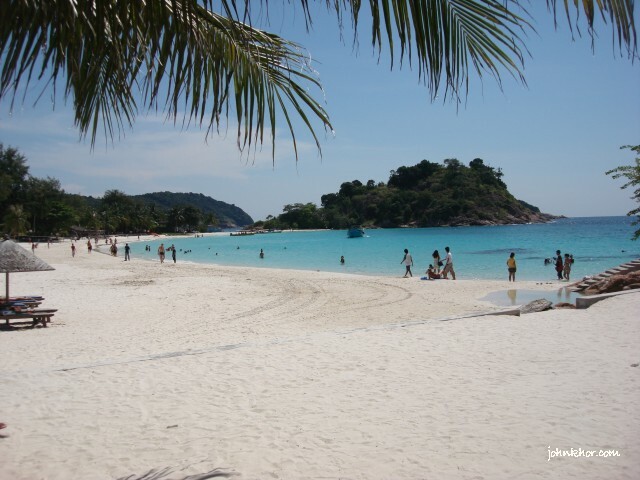 The beach and sea condition were comparable with our Penang’s Batu Ferringhi beach.’ When we reached hotel’s lobby, the long stretch of white sands and beautiful sea totally blew us! Speechless and too beautiful. Now I knew why all my friends insisted that I should pay Pulau Redang a visit. Redang Island Long Beach @ Pasir Panjang. Beautiful beach view of Pulau Redang Long Beach. 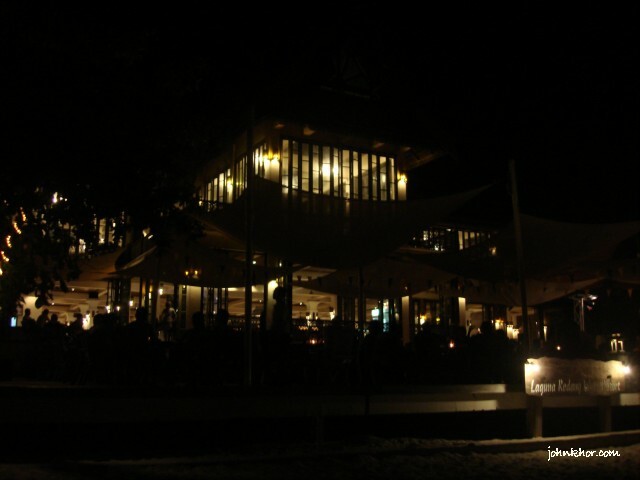 When we reached Laguna Redang Resort lobby, welcome drink were served. 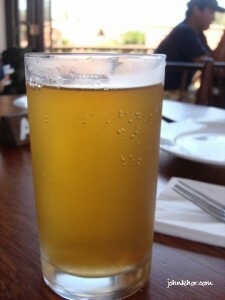 A sour plum drink. Good for the 1 hour sea-sick we had before we arrive. The drink was so nice that we opted for a second glass. Laguna Redang’s Welcome Drink (Sour Plum Drink). It’s good for sea-sick. 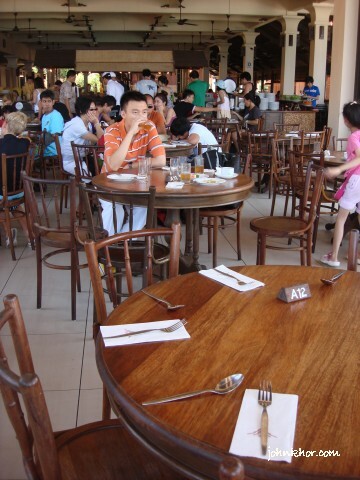 The lunch buffet is at 12pm – 230pm. So, we went to More More Tea Inn to take some pictures and checked out the gifts at the gift shop. 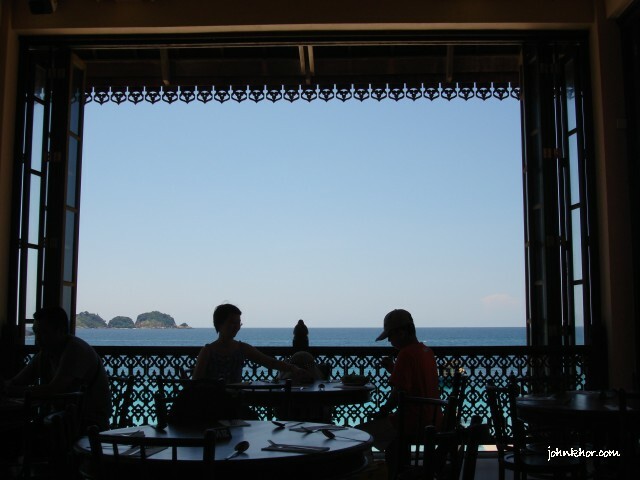 More More Tea Inn @ Redang Island. 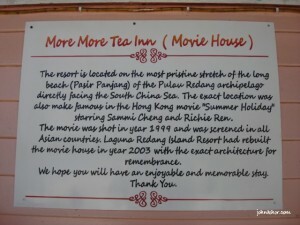 More More Tea Inn @ Summer Holiday movie. Origin of More More Tea. This Summer Holiday movie made Pulau Redang more famous in Asia. You get to watch Summer Holiday in one of the hotel’s TV channels. 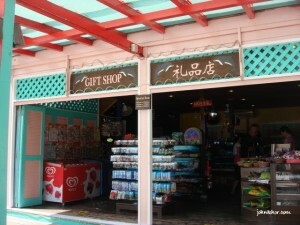 More More Tea Inn Gift Shop. Operation hour is 9am-12pm, 1pm-7pm & 8pm-10pm. Their stuffs are not as expensive as what we expect. Lunch time! 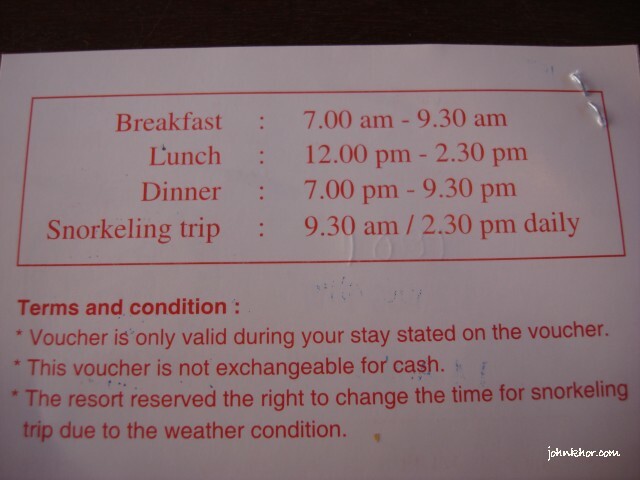 Frankly speaking, when we booked the Laguna Redang Package, we were told that the resort was a 5-stars hotel, so we kinda expect a 5-stars buffet. It turned to be a 3-stars buffet. The foods there was just so-so. You need to present this voucher to get into the restaurant. Breakfast, Lunch & Dinner Buffet Time. 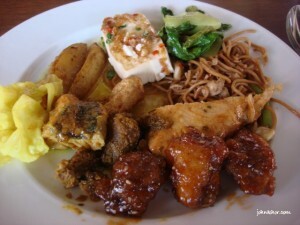 Lunch Buffet @ Laguna Redang Island Resort. 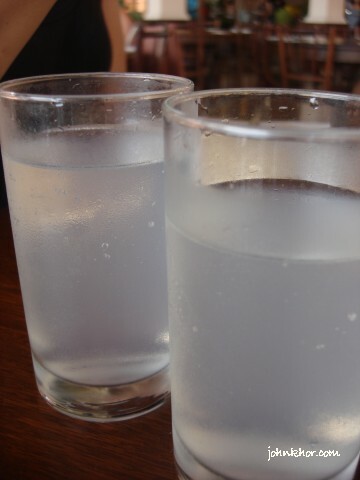 Very refreshing drink. I forgot to ask what’s is it. We were lucky to get to sit at A13 table. We could view the sea and the beach from where we sit. Cool! Very relaxing view. A view of Laguna Redang Restaurant. Me, enjoying the scenery! 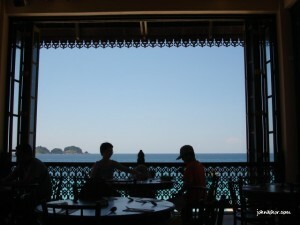 Seaview from Laguna Redang Restaurant. It’s so relaxing to enjoy lunch here. So nice! Very very relaxing! The check-out time is 11:30am and check-in time is 1pm. After lunch, it’s check-in time. 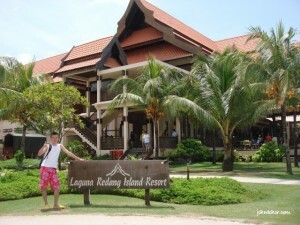 Our rooms were at the Laguna Redang Island Resort jetty. We walked there. Before that, we went to the Recreation Area to rent our goggles and life jacket. Each of them costs RM15. Again, check with your travel agent whether this rental are included in your Redang package. 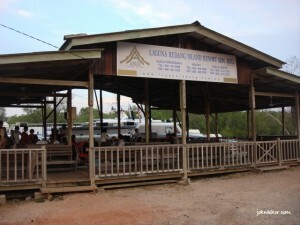 Recreation Area of Laguna Redang. 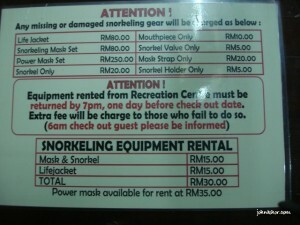 Rental rates of snorkeling equipments. You can rent an underwater camera for Rm100/day or you can buy an underwater analog camera for RM50. We only managed to book Standard room cos it was quite full by the time we booked. So, this was all we could get. We were kinda disappointed with the room condition. 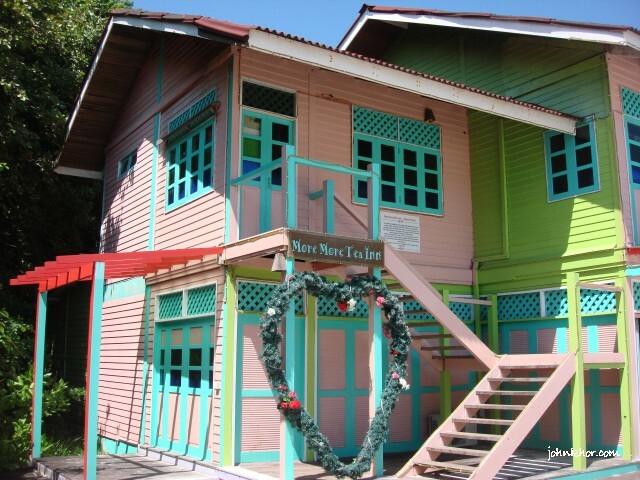 It looked like motel rooms that cost around RM80 a day. Laguna Redang Island Resort Standard Room. The room can accomodate up to 3 persons. 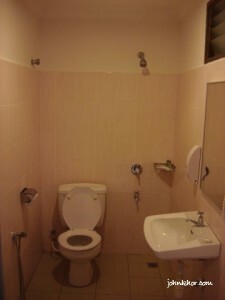 A very simple toilet. Is this 5-stars standard? Anyhow, we changed and get ready for our 1st snorkeling at 3pm. We gathered at the hotel’s jetty. 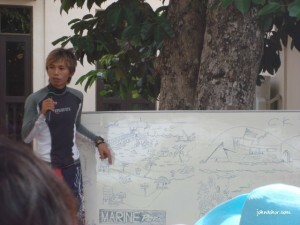 A handsome guy explained to us the proper way to use the life jacket and the goggles and also dos & donts of snorkeling. Handsome instructor of Laguna Redang. The instructor explained to us about Redang Island Marine Park on our 2nd day snorkeling. It’s an open sea snorkeling. The boat trip took us 30mins++ to reach the snorkeling site. 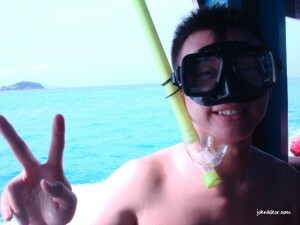 Me, preparing for snorkeling @ Pulau Redang. At first,we were not so used to snorkeling and the gadgets. After a while, we finally get used to it and started to enjoy the beauty of the sea. I am really in awe of the beauty of the sea. You really need to see it yourself to understand what I say. Another thing to remind you is that you must either buy a waterproof camera or a marine case for your camera if not you will regret. I forgot about buying a marine case for my camera. It was last minute and the shop did not have ready stock. We really enjoyed the snorkeling a lot and at around 430pm, the boat took us back to hotel’s jetty. 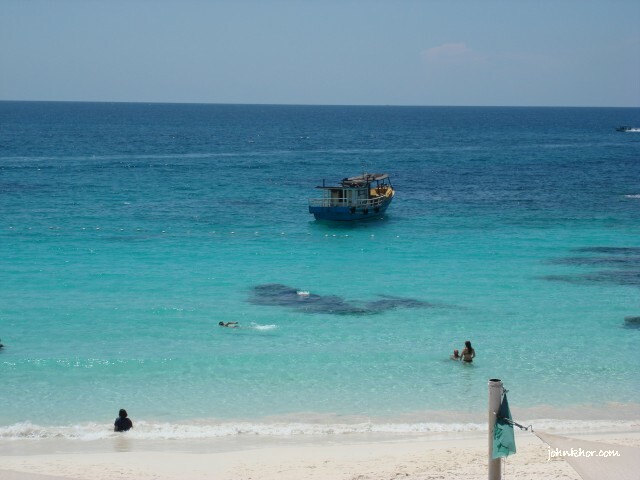 Each snorkeling session is 2 hours, including the briefing time and the boat trip to and from the snorkeling site. 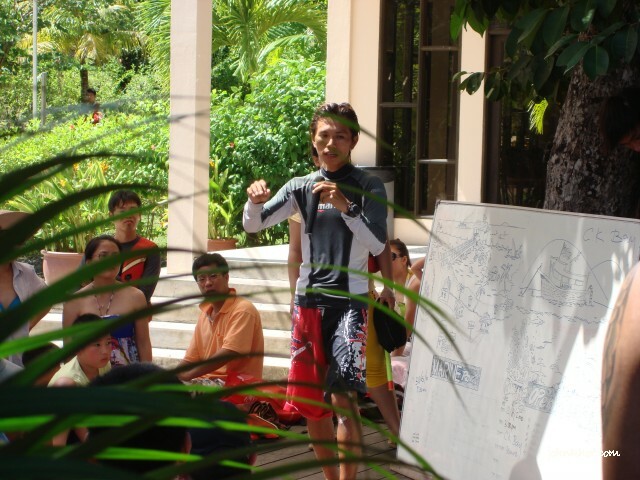 Once back, we continued our snorkeling session at the beach in front of our resort. It was fun and nice too. There are fishes and some corals to see. 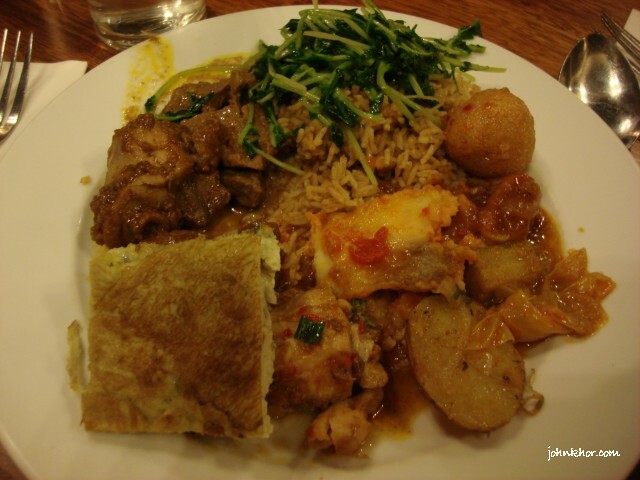 Finally, it’s dinner time and the dinner buffet started from 7pm – 930pm. 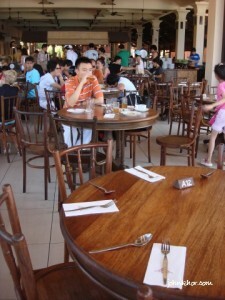 The dinner buffet rotated between normal dinner buffet and BBQ dinner each day. Again, the dinner buffet was just so-so. And they only gave you sky juice and no cordial drinks or juices. I guess it’s one of their ways to earn more money cause we needed to order drinks if you preferred something better than sky juice. 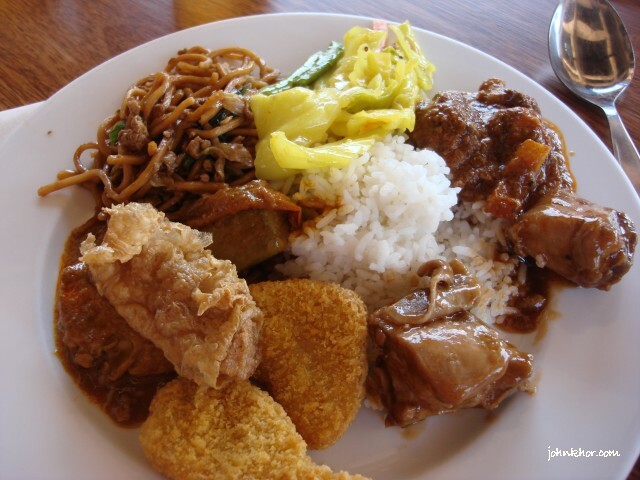 Dinner Buffet. 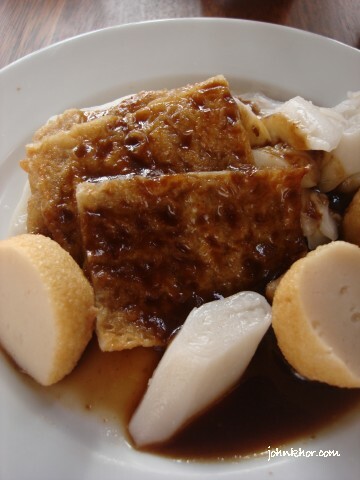 The fish ball is kinda nice. Every buffet, there will be a combination of Oriental and Western foods. The macaroni and spaghetti are too hard to chew but the sauces are good. After dinner, there’s a live band for you to listen songs or you can just lay down at the chairs at the beach and gaze at the stars. Or just stroll down the long beach and listen to the sound of the waves. Breakfast starts from 7am-930am. The breakfast is above expectation, I would say cause those things that we like are there, muesli with lots of raisins, Koko Crunch & Honey Star cereals, fresh milk, chicken sausages, omelette and eggs. And they served orange juices. Some of the dishes of breakfast buffet. 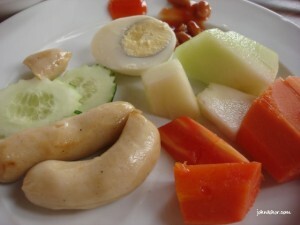 They serve the same fruits: watermelon, honeydew and papaya. 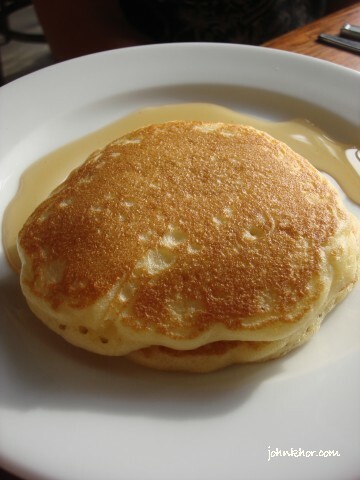 They serve pancakes too with maple syrup or honey. Chee Cheong Fun @ Breakfast Buffet. Kinda nice too. 930am is our 2 snorkeling trip. 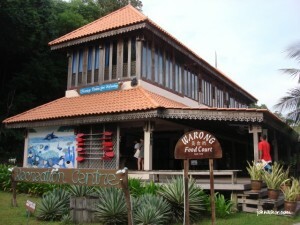 This time our snorkeling site is the Redang Marine Park Center. If you want to take photos with a lot fishes, this is the place. A lot of fishes here and beautiful corals. Two places you must snorkel is one near the jetty and another one is a shipwreck. And the marine park is really beautiful. Relaxing view of Redang Marine Park @ Pulau Betong. 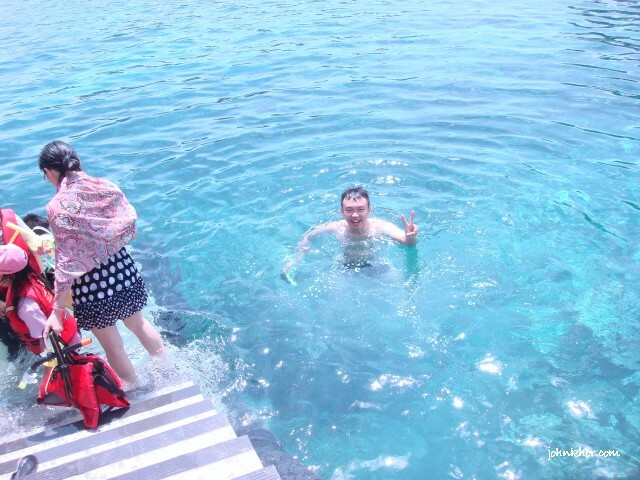 Swimming at Redang Marine Park Center’s jetty. 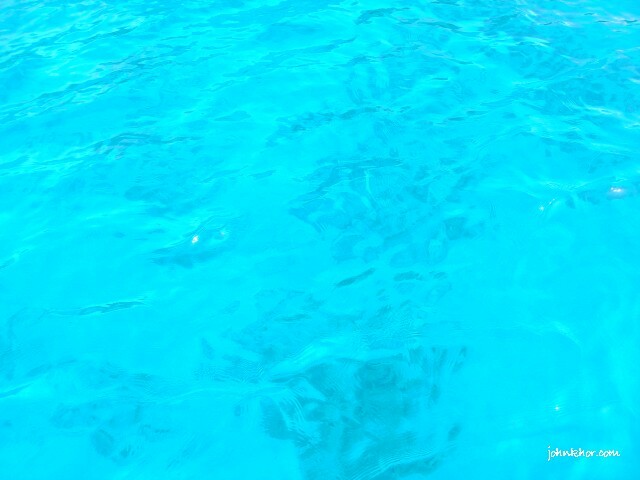 The water is crystal clear. After that, as usual, we went for our lunch buffet. Again, the buffet is just so-so only. The sesame chicken is good! 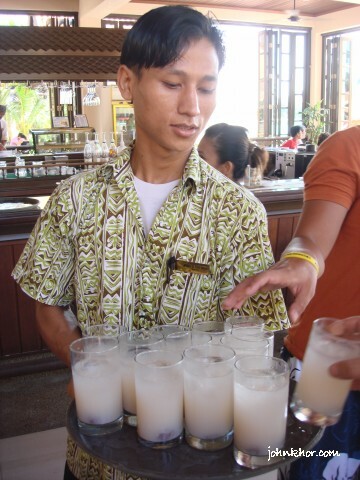 Longan drink for lunch buffet @ Laguna Redang. Relaxing view of Pasir Panjang, Pulau Redang. 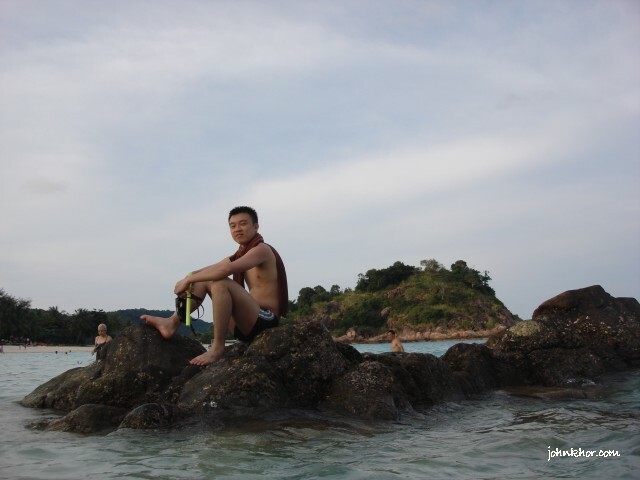 Enjoying the beautiful sea of Pulau Redang. We prepared for our 3rd snorkeling trip which was an open sea snorkeling site, the farthest snorkeling site among 3 of them. 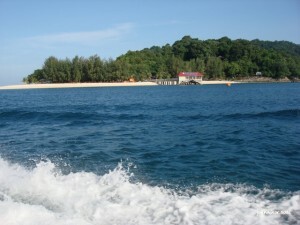 The open sea snorkeling site was called Cik Keling. Cheers! Enjoying the cool wind! The farther you go into the sea, the clearer the water is. We were told not to go to the beach because of the our human’s smell that will cause the turtles not wanting to go to the beach to lay their eggs. The Cik Keling open sea snorkeling site is the most beautiful among all. The diversity of the corals and the clearness of the sea water made my experience there unforgettable. 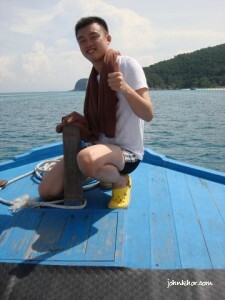 I heard from the boatman that everyday they will go to different open sea snorkeling sites. Hope to be able to snorkel to more open sea sites. After the fun time, we continued snorkeling at the sea in front of our hotel. Beware of the rocks. They are very slippery. After that, we went swimming in the swimming pool. 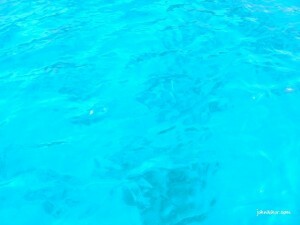 We called it as reverse osmosis because the sea water was very salty and we thought that by swimming in the pool, we could actually absorb back the lost water content in our body. Haha. Is it true? I don’t know. But swimming in the pool after the snorkeling in sea water was really refreshing and you did not have to worry about the salty water. Haha. 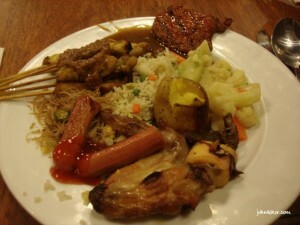 Finally, it’s BBQ dinner buffet. At least, this buffet was up to par. We enjoyed the food a lot especially the satay and its gravy. BBQ Dinner Buffet. The satay’s good. After that, it’s free and easy. We sat at the bar and enjoyed the music by the live band and later ZzzZzzZzz. 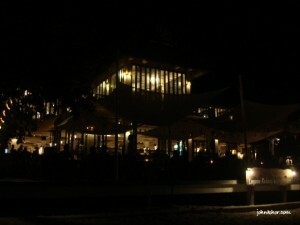 Nightview of Laguna Redang Island Resort. 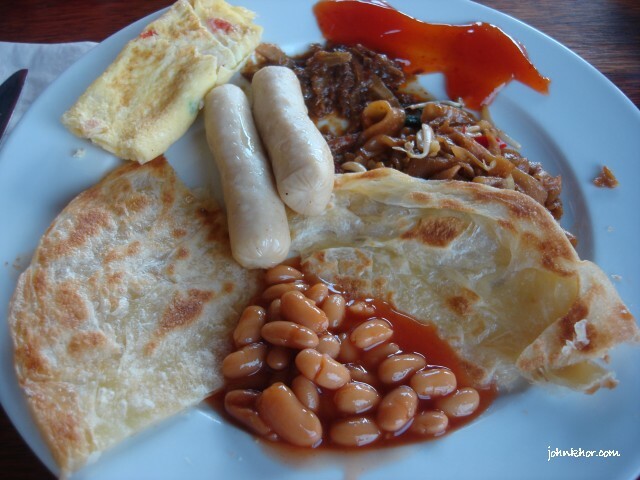 Next morning, we woke up early to have our delicious breakfast buffet and quickly pack our things and said goodbye to Redang Island because our bus departure time was 11am and we needed to board the 9am boat to Merang Jetty. Breakfast Buffet. The chicken sausage is good! 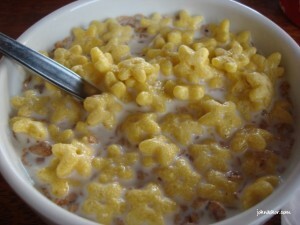 My favorite cereal – Honey Star @ Laguna Redang. After you have checked out, remember to collect your boarding pass and give your luggages to the porter. And another thing, before you confirm your Redang Island Package, remember to get your bus departure time at around 2pm, so you do not have to be so rush in the morning as the boat has only two trips, one is 9am and another is 12pm. This Redang Island trip is a really fun-filled, eye-0pening and happy trip. I will miss all of it especially the snorkeling part. Lastly, the quote on one of the T-shirts that they sell at Merang Jetty is very true. Eat, Dive/Snorkel & Sleep. 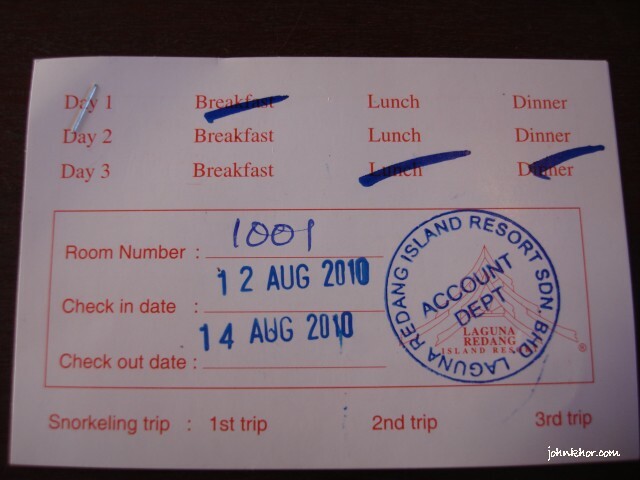 That what exactly what we did during our stay at Redang Island. 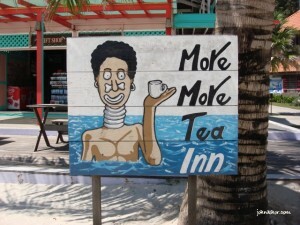 P/S: I think they should change to this: Eat, Dive/Snorkel, Relax & Sleep! Nice post! 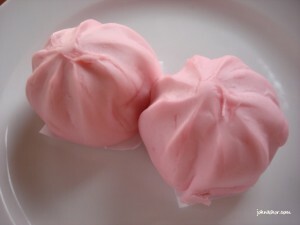 I am actually looking for info about Redang and google leaded me to your site! It is indeed very helpful! Keep up the good work!!! read ur post and found it to be really useful. 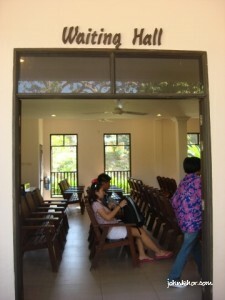 I was wondering, do we need to walk a really far distance from our standard room to the main building or to the beach? Ayat anda – At first, when we saw the beach and the sea at Laguna Redang Island Resort jetty, we were like, ‘Huh? Is this what I heard about Pulau Redang? – cukup mantap untuk menarik saya membaca hampir kesemua komentar anda dalam web ini. Saya harap mendapat pengalaman pertama yang serupa seperti anda nanti…Terima kasih. Terima kasih kerana mengunjungi blog saya. Orz. Haha. Harap2 blogpost saya tentang Pulau Redang sedikit sebanyak datang menolong anda dalam mengatur lawatan kamu ke Pulau Redang. Check juga blogpost I berkenaan dgn barang2 yang mesti dibawa ke Pulau Redang. Kalau tidak nanti terlepas pula peluang utk betul2 menikmati keindahan Pulau Redang. ow where to get bus ticket from KL to redang? please advise. I am really sorry. I can’t help you with this question. I use tour package for my Redang trip. So, I am not sure where to buy. 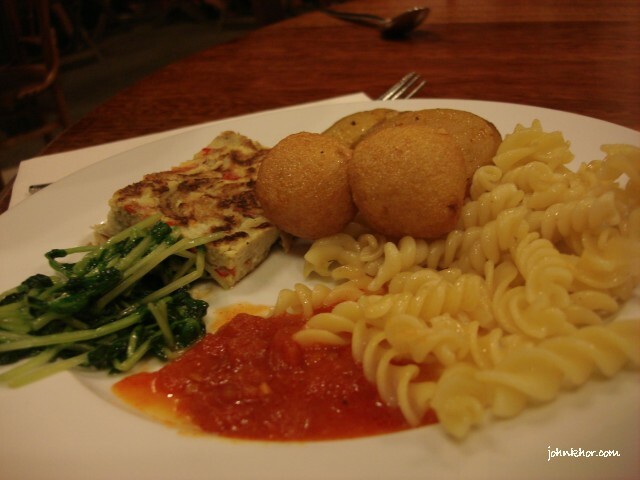 Maybe you want to try Puduraya? I believe you can buy your tickets there. 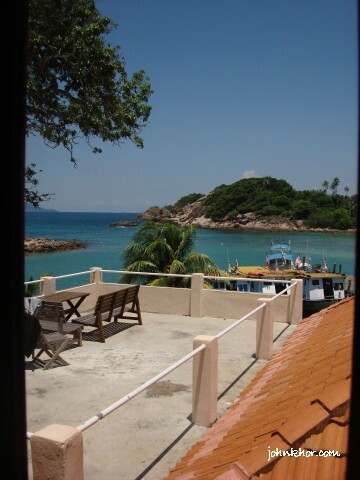 u can buy the bus ticket to kuala terengganu from putra bus station near pwtc, and after reaching to kuala terengganu u will need to hire a cab to merang jetty to get a ferry or boat for redang island. Thanks for your answer. It will surely help someone. 🙂 I just want to know, how much is the fare for the cab to drive you to Merang Jetty from Kuala Terengganu or do they provide bus? Surprised tht I came upon your blog while looking up info of Redang… 🙂 nice info there.. How r u neway? Read ur 10 things to bring and for me will be more as we’ll be diving there.. Can’t wait! thx u for sharing all those information that very useful for us. may i noe that, the photo show that the laguna hotel was only “soso”…izzit?? 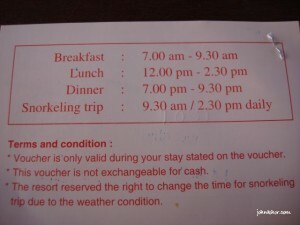 ?for the real condition of the hotel, izzit was exactly same like what u shown to us?? 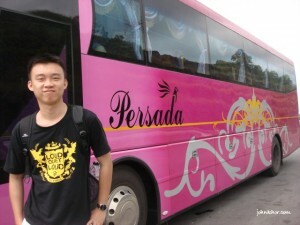 lastly,may i noe that where u get ur bus from penang direct to merang jetty? and how much for 1trip? Yup. The room for Laguna Beach Hotel is just as what I have photographed. It’s really ‘so-so’ only but my room is not high standard one la. 🙂 If I am not mistaken, it’s just the normal room only. It’s inside my tour package. 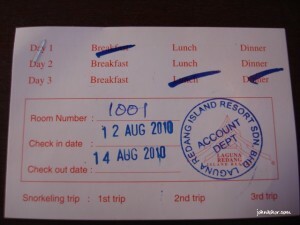 And during that time, the ticket to Merang Jetty and back to Penang is RM60 per trip, so total RM120 for the bus tickets. Hope this helps. 🙂 Enjoy your trip and do read my things to bring. thx u for telling me all useful detail. but i still have 1 question to ask. what is the bus company? and izzit the condition of the bus is comfortable and big enough? thx u…have a nice day. Hahazz… No more long n straight.. It’s shorter, browner n curlier now… 😉 god mum smile n say u still remember ah.. Hehe..
Oh ya, U love beach? Was wondering if u’re interested in diving? Thanks for sharing!! I was researching on planning Redang trip and this is absolutely helpful for me. Keep it up dude. I wanna see more interesting stuff from you. Previous story iOS 4.0.1 Is OUT!